I thought it worthwhile to re-post my 2008 slides on the credit crisis. I wrote these slides just as the crisis was getting started (right after the big defaults), but I still think my analysis was correct and better than post-hoc discussions that are going on to this day. 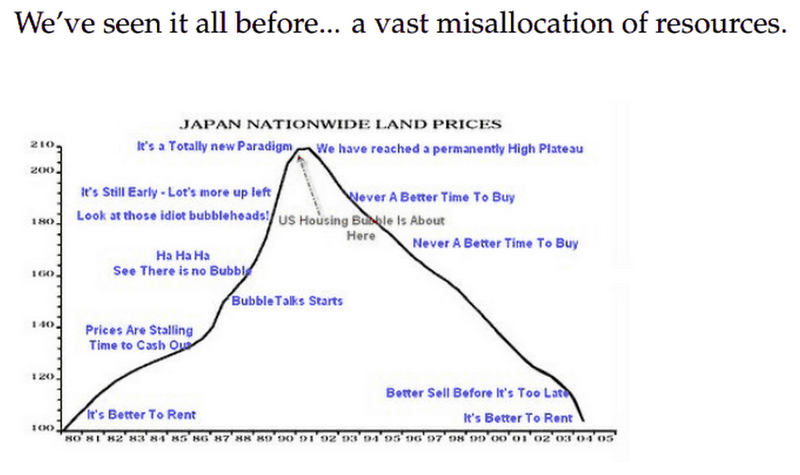 I believe I called the housing bubble back in 2004 -- see, e.g., here for a specific discussion of bubbles and timescales. The figure above also first appeared on my blog in 2004 or 2005. (2004) ... The current housing bubble is an even more egregious example. Because real estate is not a very liquid investment - the typical family has to move and perhaps change jobs to adjust to mispricing - the timescale for popping a bubble is probably 5-10 years or more. Further, I am not aware of any instruments that let you short a real estate bubble in an efficient way. I discussed the risks from credit derivatives as early as 2005; see also here and here. Finally, there was a lot of post-crisis discussion on this blog and elsewhere about mark to market accounting: were CDO, CDS oversold in the wake of the crisis (see also The time to buy is when there is blood in the streets; if you want to know what "leading experts" were saying in 2008, see the Yale SOM discussion here -- oops, too embarrassing, maybe they took it down ;-), or was Mr. Market still to be trusted in the worst stages of a collapse? The answer is now clear; even Fannie and Freddie have returned $180 billion to the Feds! I think your postmortem of the housing bubble is basically correct (at least the bits I've read). That said, though I also "called" the housing bubble, the thing that I and most other people missed (until it was too late) was the size and scope of it, namely, the implications for the financial system and the degree to which the broad middle class were vastly over-leveraged (which has been the biggest drain on economic activity and employment over the past few years); fewer still have been able to make these sorts of predictions consistently. One need not subscribe to strong-form EMH to recognize that there are very few systems or people that are actually able to make these sorts of calls better than the market, i.e., consistently in the long run (without some special leverage, access, narrow expertise, etc). Of course individual market participants will sometimes beat the collective market in some pretty big ways, that is basically tautologically true (how else could we have a market?). Suggesting that we called something right does not mean that EMH is not basically valid (albeit not nearly to the extent suggested by some ivory tower academics). I suppose my point here is that recognizing that markets are often wrong, sometimes even irrational, is not terribly useful insight unless you have a better, proven, systematic approach. There were plenty of EMH skeptics in finance and at various levels of government that did not appreciably understand the nature of this either, not enough to speak forcefully. Many leaders in government also had all kinds of other reasons and biases to support the bubble. Put differently, the non-market based approaches to dealing with market imperfections is beset by many of the same problems (maybe even more). Curiously one of the most obvious things we can do improve financial market stability would be to place bright line limits on the amount of leverage that we allow in the financial markets, both on aggregate and institutionally, and that is one area where few are really willing to venture. Why do you think that is? I'd say the reality is that most academics, leaders, and even voters are every bit as stupid or irrational (e.g., they are afraid of inhibiting growth and discount the downside risks when these tend to blow up). These macro-economic level regulations and the like (e.g., interest rates) are probably the clearest and best opportunity to beat the long-run performance of untamed markets and yet ... we do relatively little of it in practice. Instead we focus on the penny-ante regulation that tends to be obsolete by the time it is promulgated or impossible to actually implement/enforce (as intended) in practice. I'm generally pro-markets. I'm also OK with weakest versions of EMH (hard or individuals to beat markets). But what the "experts" were saying during the bubble (strong EMH, so no bubbles! actually I think Fama still says this) and just after it burst (medium strong EMH, so CDOs must be correctly priced now...) was pure comedy gold at the time. Now, 5+ years after the crisis, it's not comedy. It's tragedy if "the profession" can't learn from a catastrophe. capitalism can always count on socialism to save it. The original Sid Meier's Civilization came out my senior year of high school. It cultivated a sensibility about models of government that often leaves me baffled when people categorically pick one over the other. there are so many variables that even if what is optimal is agreed upon simple ideas like "That government is best which governs least" can't be right. best. theories and principles are useless with such complex phenomena. only evolution works. so one of the consequences of physics envy on the part of economists may be endorsement of ideology and other simple-midedness. arminio fraga, a soros protege, said, "i'm not religious about how big a government has to be...large governments have done well in scandinavia...but there's no country which has developed without good government..."
1) Agree that bubbles are hard to predict and that govt policy had an impact on the housing bubble. "A little calculation is in order: suppose unfettered markets lead to systemic crises every 20 years that cost 15% of GDP to clean up. I think that's an upper bound: a $2 trillion (current dollars) crisis every 20 years. Unless you think you can evaluate the relative GDP growth effects of two different policy regimes with accuracy of better than 0.1 percent, then the intellectually honest answer to the policy question is: I don't know. No shouting, no shaking your fist, no lecturing other people, no writing op-eds, just I don't know. Correct the things that are obviously stupid, but don't overstate your confidence level about additional policy changes. (Note I'm aware that distributional issues are also important. In the most recent era gains went mostly to a small number of top earners whereas the cost of the bailout will be spread over the whole tax base.)" The minority subprime angle is real but I don't see the reason to focus on that. Just one tragicomic / corrupt aspect out of many. "Why did "sophisticated" investors accept AAA ratings of CDO tranches built from these mortgages?" because like someone who shall remain nameless, they believed that mathematicians and physicists are the smartest people around. how could their models be wrong? and because public corporations with long dead founders are run for the benefit of their executives not for shareholders. you're forgetting soros's principle of "reflexivity" and so is fama. in the case of economics, unlike the natural sciences, opinion and credit influences the reality and creditworthiness. the experience was that prices for houses never went down, so if your ninja borrowers couldn't pay they could sell. but all that free money drove up prices. that's reflexivity. abstract and meaningless are such essentially anglo american discussions. get economists and financiers and lawyers and other upper class twits out of policy decisions and growth is increased. but the built environment, construction and maintenance, should be employing an ever greater percentage of americans as these jobs cannot be done outside the us and don't require much education. instead it employs 4 percent of the workforce. finance employs more. One tiny note: I would avoid using the profit of Fannie and Freddie as an indicator of overbought/oversold CDO's at the time they were taken into conservatorship. Their profit model now is explicitly selling the UST's guarantee on mortgages - not their own guarantee. (Of course, this brings up the big unresolved question of how much of the entire financial system's profit derives from monetizing a government guarantee.) As for the actual performance of mortgage CDO's the track record has been mixed. Many did go back up in price but many others did, in fact, keep going down - to zero. well of course some tranches went to zero. they were expected to from underwriting. for buyers it was just a question of when. greenberg claimed aig only underwrote, via cdss, "super-senior" tranches and all of aigs problems resulted from mark-to-market and overselling. but he wasn't a disinterested observer obviously. "... how much of the entire financial system's profit derives from monetizing a government guarantee..."
or from free money from the reserve bank. personally, i don't think low cost money from the reserve bank is profitable. western financial institutions are awash in funds and have nowhere to deploy them. Private investors IMHO are in the same bind. You wanna buy the S&P 500 at 1850? Ha ha ha. UST's at current yields? Ugh! Cash, even at 0%, is cash you don't want because inflation (as I would measure it) is running about 10%, and even understated CPI-U looks to be 3% this year. I refer to the 1980 version of the stats. Gasoline, fresh vegetables, jewelry, etc... all the stuff you would have put in a 1980 basket are going up at 10% per year. In fact, you would be hard pressed to identify for me any good that wasn't going up in price that fast without resorting to weird intangible things that are ill-defined. When you were an undergrad, you could take out $20 when you went to the ATM, right? is there pressure to lie? if so, why? and where does it come from? The US Gov pays interest and benefits tied to CPI-U, so that is motivation number one, and high inflation headlines are politically unpopular, and that is motivation number two. However, CPI-U *does* actually accurately measure what it claims to measure in any given year, so nobody needs to "lie". It is just that I don't find CPI-U a useful measure of inflation for evaluating investment return. The price of "standard gasoline" is very important to the American consumer. If we mandate a reformulation of gasoline to include more ethanol, and that increases the price, then CPI-U won't record that as inflation because you are now buying a different "better" thing. But, of course, it isn't better, and those on a CPI-linked pension may find themselves (as David says) eating catfood to afford fuel.